Apart from the regular domestic helpers at our home in KGF, there were several other indispensable people who were ‘compulsory appendages’ to our daily lives. 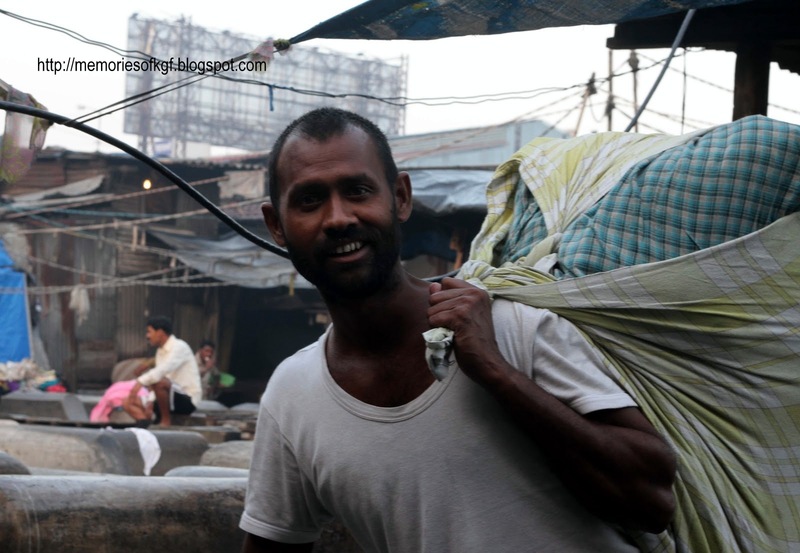 ‘The Dhobi or laundry man’ was one such person. 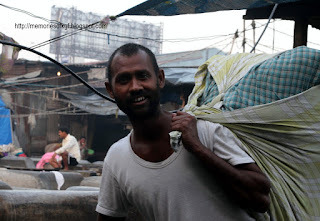 The Laundryman or Dhobi would visit our home once a week in KGF to collect the dirty linen. Bath towels, Bed linen, curtains, kitchen cloths, and other heavy items were given to the Dhobi for washing and ironing, as these items being too heavy could not be washed at home. We had no Washing machines in those days. He would also collect the lighter clothes that were washed at home, and take it for ironing.. It was quite a procedure when the Dhobi came. There was a special dhobi’s account book. The Dhobi would spate each garment and make piles of them according to their nature. Each item of clothing was listed separately with the number of items written beside them. (For example: Bed sheets – 8, Pants -5, Dresses -10, Towels- 6 etc.) 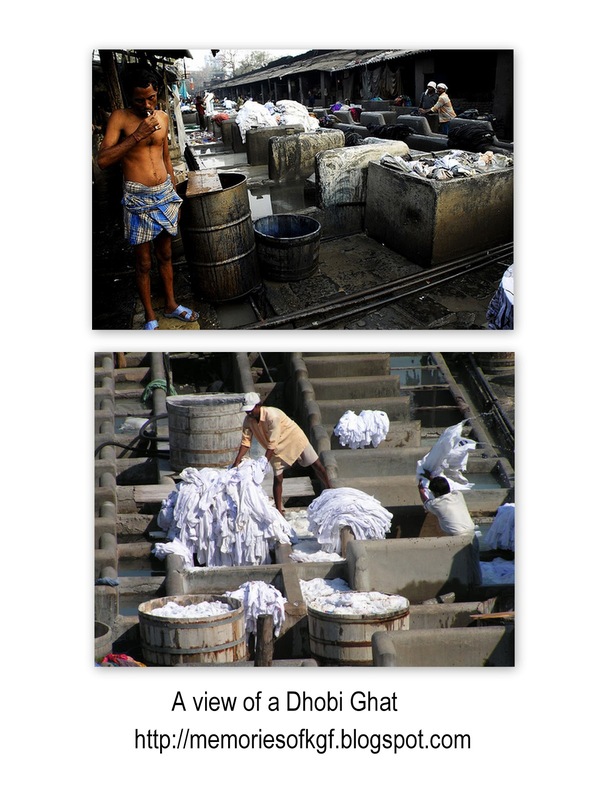 We would take turns to write the Dhobi Book when he came. After he had finished listing the dirty linen and making it into a huge bundle, the dhobi would lay out the freshly washed and ironed clothes which he had taken the previous week and lay them out neatly on a clean bed spread or carpet. Then the accounting would begin in reverse order. This ritual would be repeated every week. The charges varied for each item of clothing / linen and once a month, the dhobi’s account would be settled. He would get a lump sum payment for all the washing and ironing that he had done through out the month. The Dhobi would mark a unique symbol or character on the garments / clothes belonging to a particular household. Every family’s clothes had a personal Identification Sign which the Dhobi would mark on the clothes given to him for washing. It would be marked in Black Indelible Ink and no amount of scrubbing would get it off. Even though hundreds of clothes belonging to different people were washed and dried together at the dhobi Ghat, no one’s clothes would get mixed up due to the unique marking code that the dhobi had for each family!! Amazing. The Garments were washed in the Dhobi Ghats where water was stored in huge Barrels and Drums. The dirty linen was stone washed and beaten with a heavy stick and many a time, buttons and bows would fly off into nowhere. Sometimes the linen needed to be bleached, so the garments and white sheets were immersed in huge vats of boiling water to which a generous amount of Bleaching Powder or ‘Dhobi’s Dust’ was added to give the linen the shining whiteness. However, many a time due to dis-proportinate use of bleaching powder, many of his customers would suffer from skin irritation called ‘Dhobi’s Itch’ or ‘Jock itch’. Similarly, huge vats of Indigo were also kept ready to soak the clothes to give it the final dazzle of whiteness. Thereafter all the garments were dried on many lines in the hot sun. The next day would be ironing day and all the washed clothes / linen would be neatly ironed with huge and heavy coal irons. The dhobi would then come again to every household and the process would be repeated. The Dhobis were the forerunners on the Indian subcontinent to modern professional Dry Cleaners and mechanized laundries. Since the dhobi charges are much lower than those of dry cleaners, they are still popular with most households. 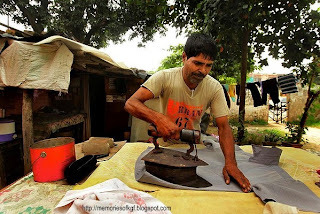 We can now see Dhobis who specialize in Ironing at every street corner and they are in great demand every day. The dhobies were muslim families living in a cluster around the two dhoby ghats in KGF. I remember these places, one near the railway line in Top Line in Oorgaum and the other behind Giffords in Champion Reef. We boys would watch them work near big water tanks.